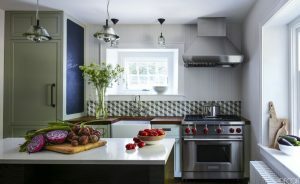 Modernizing a kitchen can be expensive. Basically, it’s expensive. And you can’t tolerate errors while planning. This is something we’ll help you with. Below, we’ll mention 5 changes you can make. Adopt them as part of your kitchen’s final look! #1 – Modern Kitchen Bins. Modern bins focus on recycling. Thus, they come with different waste compartments. The more the better. But the point is, everything doesn’t get jammed in a single plastic bag. You can organize. And it’s much neater, cleaner, and more modern! Modern bins aren’t plastic. They’re metallic. Think of appliances as icing on the cake. Basically, don’t overstock your kitchen with appliances. Why? Because often, an empty kitchen top is the most modern-looking. A toaster, and a blender. And if you want to get creative, add in a built-in microwave! Also, get appliances that are multi-functional. Those save space. And they make your kitchen look better! Not to mention, they contribute much to your kitchen aesthetics. So picking the right one can be the difference between modern and shabby. Tip – Keep it Neutrally Colored. Stick to white, black, grey, and their different shades. You can pick any color or design from there. You can have a wavy black/grey top. Or, you could have a glimmering “ivory colored” top. And speaking of glimmer, countertop material matters. Make sure it’s marble or polished granite. Those are the most durable. And they least show signs of wear. Colors Should Mix Well With Cabinets. Countertops and cabinets should work hand-in-hand. Fix them. Make sure the doors work. And replace the handles for something better. That way, you restore functionality, without spending a lot on new ones! All your cabinets should be the exact same color. Don’t color one white, and the other black. Don’t be fruity. Also, just like with the countertops, keep the colors neutral. And make sure they contrast well with the countertops. As the name implies, splashbacks protect your wall from sink water. Your splashback is even more visible than a countertop. And it’s the most visible part of your kitchen. Also, their tiles tend to be expensive too. So you have to pick them carefully, and in tandem with cabinets. So How Do I Pick a Splashback? You can always consult an expert. For one, you can try Cut My Plastic. They’re excellent designers of home aesthetics, especially splashbacks. Contact them, and start planning your kitchen! Did You Know about These Personal Alarms that are Doing Wonders for Many Families out There?